Getting that grocery budget down. Budget at the beginning of the month before you are paid. We do it a few days before salary comes in. The grocery budget then is divided over four weeks. We only major shop once a month. It makes a huge difference not to be popping into the shop every week. You waste less money on things you should not buy in the first place. This also means our poor baby is not getting PnP animal cards. As an aside, we have budgeted two take away meals a month, or one sit down meal at a restaurant. We make the most of it, and because it is limited, we carefully pick what we want to do. We prefer the take away, because then we make it a family movie night thing. We no longer sale shop (because we find that it actually wastes money more often than not. I remember thinking that was nonsense, until we stopped doing it. Our grocery budget includes non food items like dish washing liquid and toiletries. It also includes the cat food. Yo do not have to buy everything at once. If there is something you want to buy that is not on the list, write it down for the next list. Then the next time you will end up seeing if you really needed that, because the impulse is gone. Some things we do buy in bulk: Meat, because it is cheaper like that. We eat loads of game meat, because it just has so much less fat than any other red meat we have come across. So if we bulk buy the game meat, then that is the meat. We normally don’t use it all up in one month. With the menu planning it is so much easier to balance the meals, because you know what you are eating over a long period. We ensure all portions have enough veggies. Also, because starch cannot be frozen, we eat less of it. Not because we believe in Banting, but because it is icky defrosted. So if we did the bulk game this month, next month is will be chicken. We buy frozen veggies for cooking and only what fresh veggies are in season. They just are much better quality and priced when you buy in season. The same goes for fruit. We only buy fruit once a week, and then it is one or two at a time. We only get as much as can be eaten in one week. I eat about two or more portions of fruit a day and HB two, and Hubby we have to force feed. Fruit is a huge money waster. You buy too much because it looks yummy in the store, and then it ends up going bad at home. We have an A4 white board and marker next to the fridge. As soon as something is approaching finishing, we write it on the list. This is the only shopping list (other than the one menu planning weekend). We stick by this list very strictly. No deviations allowed. Breakfasts are also very standard in our house…oats or bread. And then pancakes or eggs, etc over weekends. We make our own burger patties, meatballs and planning sausages as well. We are not super healthy earth types, but it just tastes better when we make our own. A burger and chips is a good substitute for when the take away craving hits. Like mentioned above, the biggest thing to reduce the grocery budget is the menu planning. It so easily becomes a part of your life, that there is no other way. On a weekend, we will cook something that has starch in it…like a breyani or curry that include potatoes or something like that. DO not be afraid of leftovers, they are your friend. We have a deep freezer, so we are able to freeze ready made meals and buy meat ahead. You also have to make a hard decision, that you just cannot have some things. Yes we can buy it, but it is not in the budget. If we spend it all, there will be no money saved and nothing extra to the home loan. This can only work if the whole family is committed to it. You have to work at it together and make sure everyone is happy. No one wants to feel like they cannot move an inch…so you need a tad bit of float in that budget to be human. OK here we are with the cookies. I am not doing sweet filled party packs because parents seem to not like them (even if the kids love them). Here are the cookies that are going into the party pack. I am just doing the cookies for school and I want to try out a cake I saw. If the cake turns out well, I will send it to school, otherwise it will just be cookies. For the at home party we are doing the same cookies and the capes masks. The cookies did not turn out as I hoped. I had a vision of actual Spiderman, but I realised that I would have to invest time and money into getting those right. I thought about it for a long while and eventually decided to just do with what I have. So here is what I produced. 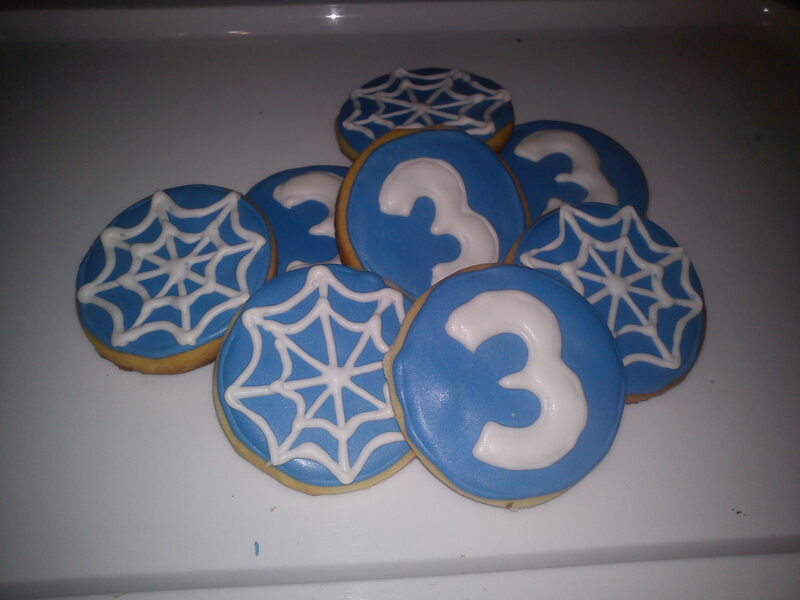 The web cookie looks like a snowflake because I could not get a deeper blue and the black will not set. I have decided if I have time to make some red cookies too. There are so many people doing wonderful things with cookies, but I do not have the experience or equipment. I just used one old fashioned syringe thing with one nozzle tip. I was not going to buy a whole set for one birthday…and the fancy food colours are so expensive. I figure the 3 year olds’ will not mind my wonky 3 or snowflake web thing. They will just lick them and eat them. I used lemon flavouring in the icing to try to counter-act the sugary sweet of the icing. I was happy the icing dried nicely. I was really worried I would not get it right. It has been a crazy week and I think I have not commented, even if I have read. I will drop by to catch up. I have decided to do a post about trying to make a different lifestyle work. I know there are so many of these posts around, they are boring, but it helps me keep track of everything. The LCHF eating has become a way of life mostly. I was sceptical at first because it looked like too much fat and meat. I am not sure how everyone else is doing it, but I have found that I am actually eating a greater variety of vegetables than I used to. I think it comes from paying more attention to meals instead of flinging random things together because I am too tired to make dinner. He has also been buying milk on sale so I use it to make yoghurt and paneer which we all enjoy. I have about 15 blocks of cream cheese in the freezer too (we got these practically free). I know you are thinking one cannot freeze cream cheese and you are partly right. It cannot be used as is or for spreading because it loses texture. Like veggies, you can still use it for cooking without any loss of taste or texture. You can still use it for sauces or baking. There are advantages to Hubby working for one of the largest supermarket chains. Certain items are marked down and sold to staff only which is where we score on the price of food. The exercise is going well and I am feeling better. I do not know if I have lost any weight because I have not weighed myself and I do not plan to do so. My weight never bothers me, it is my size. So I am happy just to fit comfortably into my clothes and not have to buy anything bigger. I decided to track my food and exercise on one of these online diaries, but I think it is fake. According to that thing, I should really be losing weight effortlessly. I am apparently eating less calories than required for me, and my carb intake is averaging at 80g per day. I know all that sounds complicated, but the online tool works it out for you. I am pretty accurate with logging everything I eat and the formal exercise. I do not track walking up and down stairs or to the store as part of exercise. I guess I just assumed I ate too much bad stuff and the diary makes me realise my eating habits are not that bad. I think the big thing was stopping all the sugar in my tea. It all started when I was breastfeeding but I do not have that excuse anymore. According to the diary, my biggest carb/sugar food is the milk I drink. I love milk so I am not sure if I would stop drinking milk. My aim with the lifestyle is to be healthy because diabetes is a reality in my family with my sister (who is not overweight) being pre-diabetic and she is only 18 months older than me. My Mom is a confirmed diabetic who cannot get her blood sugar levels under control (she refuses to modify her eating and I know she is heading for insulin). I think it is working for me and I do not feel restricted in what I eat. I am not terribly strict and I am not trying to make fake bread or pasta. That works for some but I do not have the time, budget or patience to make substitutes. Runnermom has been making some interesting things and I admire her perseverance. If I want bread, I will eat a slice every now and then. I think my aim is to maintain health. Enjoy the weekend all. It is perfect cuddle weather.